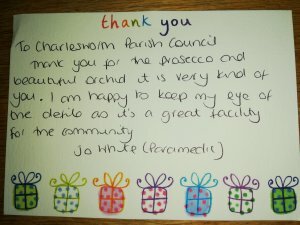 It was lovely to receive a "Thank you" for our thank you gift to Jo White, one of the fabulous Paramedics who look after the defibrillators in the Parish. 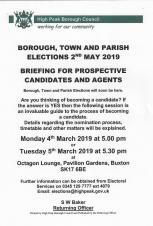 The public are entitled to be present but such persons only as are registered as local government electors for Charlesworth Parish will be allowed to vote at the meeting. 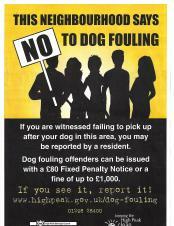 The next parish council meeting will be held at Charlesworth School (Long Lane site) on Wednesday 20th March 2019 at 7.30pm. Please come along to support the Parish. Charlesworth Parish Council have been awarded a grant by The Woodland Trust. 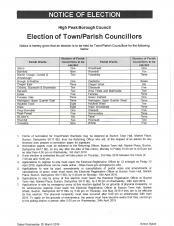 The next parish council meeting will be held at The Village Club on Wednesday 20th February 2019 at 7.30pm. Please come along to support the Parish.